Turn Off the light, and it will turn ON: endless fun! Off. On. Off. On. OffOn. OffOnOffOn.. The light switches ON when someone turns Off the light. This is my circuito.io's Arduino Day Prank Contest prank! Using the platform, I ended up this circuito.io link. There, you will find some sections, which will help you build the project. So, as always, the first thing we need to know is the bill of materials. This project doesn't use many components, so it was pretty straight-forward. Once we know everything works OK for sure, it's time to upload the final code to the arduino. 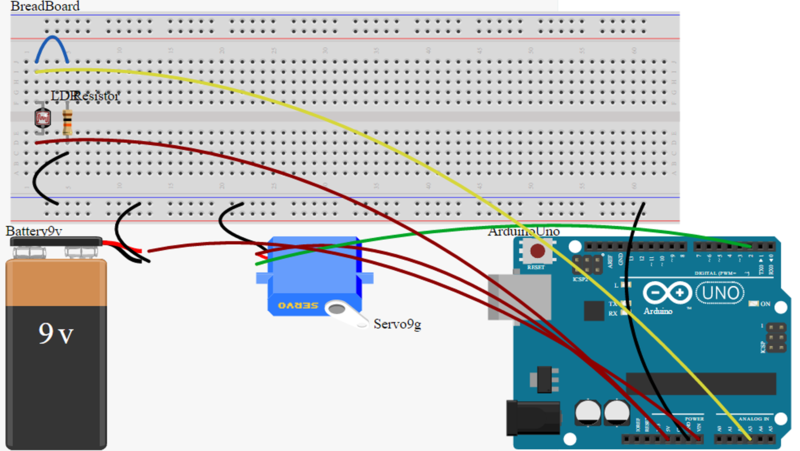 At the bottom of this page, you will find a file called "The Troll Switch.ino", which you have to copy on the Arduino IDE and upload to the board. Now, the last step is to hide the cables and the Arduino. I used a flower pot because it fitted almost magically, be creative here! All you have to do is put a hidden camera, and prepare yourself to laugh. Happy pranking! Thanks to Julia and Asier for starring these videos :D.
Any suggestions or questions, just leave a comment! Here's the program for the joke. Upload it to the mounted Arduino and ready to go! Servo myservo; // We will call our servo "myservo"